The roll-down screen, the fold-up chairs, the sound-system, laptop, projector and popcorn were all prepared in the public underground passageway to coax people out of their pathway, to sit down and watch video clips they might have or never seen before. The billboard proclaiming ‘Jii Hutikka’s Clip Karavaani!’ was the beginning of ‘Clip Kino’ in Helsinki and beyond: a self-organised social event platform consisting of screening events in public spaces, featuring not full, or even short, film screenings but video clips and documentaries found online. Since this event in late 2007, I have initiated and facilitated similar events. This activity was and is motivated by my interest in participatory and social processes as an artist-organiser, and as a pedagogue in online and digital media culture. Over the years, I maintain a belief that such a platform can explore in corporeal public space what you, I, them and we are watching or find interesting online; opening up discussions related to online media, copy and remix culture; but also in the process, create space for different groups to meet, reflect and encounter each other. The following text elaborates the development of the Clip Kino platform as it emerged from that roll-down screen onwards, including reference to the surrounding contexts which the process and events have been situated within. Six students from Taidekoulu (Art School) MAA—Inka Jurvanen, Emilia Liljeström, Sera Martikainen, Marianne Mäkelin, Mikko Mällinen, Tessa Siira—were given the assignment during the ‘Self-organising and Networking’ course that I was teaching at the Art School on Suomenlinna, Helsinki : to create an almost zero-budget “clip-kino/micro-cinema” in public space, as part of the Valon Voimat (Forces of Light) Festival in November 2007. That year the festival had focused on site-specific works near the single underground metro line of the city. Over 10 years, Valon Voimat has been a festival that “research[es] the urban space and its use during the darkest period of the year”, promoting site-specific urban interventions, specifically involving ephemeral and static light installations, fire-arts and mixed-media club events . The student group took this context and the assignment combined, to form a project called ‘Clip Karavaani’, creating a fictional master of ceremonies called Jii Hutikka (equivalent to ‘Joe Tipsy’) who despite never turning up for the events, held interests in hobo/nomadic lifestyles, caravanning, elk-hunting and avantguard films. Behind this guise the students crafted an aesthetic, and home-brew style of communications, for a series of 4 ‘cinema on the road’ events, that happened over a period of 1 week in 3 different locations: an underground metro passageway, a private design studio, and a public media library . The theme chosen for all the Clip Karavaani screening events was “road movies”, a term which the group entered into video-sharing website databases, such as YouTube and Internet Archive, to yield clips for presentation. The curatorial dynamic in the group was to collectively nominate clips which were then watched among themselves, ‘rated’, and then edited into a screening order. Some clips were played according to locational context (for example the ‘helsinki metro sunset’ clip in the underground passageway) or followed each event (such as the ‘kerouac reading on the road’ clip). Ripped from their original viewing platform online, approximately 15-20 clips were played at each event representing a very heterogeneous interpretation of the theme. One person lined up the video in the player, another adjusting the volume to suit. A big white cardboard hand-pointer emerged in the 2nd and 4th Clip Karavaani events to divert attention of passers-by to come into the unusual fold. At each, there were small audiences of 10-20 variablyattending the events, and popcorn was handed out free to all those who wished some. The action of the Clip Karavaani screenings followed a tradition of grassroots and speciality cinema-clubs, and video activist screenings , using distributable formats such as Super-8, VHS and DVD formats. The ‘one night only’ nature of the Clip Karavaani events, including the forever-absent director Jii Hutikka gave a vagabond or circus theatricality to the proceedings. Due to their consideration of relationship between context and content, albeit at a smaller conceptual and technical scale, Clip Karavaani bares similarities to the ‘Social Cinema’ project by Neil Cummings and Marysia Lewandowska which, during the London Architectural Biennale in 2006, “turned unbuilt spaces into auditoria” where “films about, set in, or commenting on London and its architecture were stunningly projected upon the city itself” . Outdoor screenings, often as part of festivals or summer seasons, operate outside of the usual cinema, room or social hall context. A good example of the success of this model has been Rooftop Films in New York . However, unlike these other social cinematic events mentioned above, the content screened during Clip Karavaani events consisted solely from what could be freely downloaded from popular media sharing platforms . The curation of the screening list emerged from what the video-sharing database returned, according to keywords typed into the search function. What was returned were video’s with the video uploader’s given tags to the media, and according to the subjective choices by individuals within the organising group. What was shown in public was not limited by ownership or negotiation of access, but search-engine and subjective selection. ‘Clip Kino’ as a name for self-organised screening events based on internet-sourced video-clips, emerged in a residency application I made in March 2007 to Eyebeam Centre for Art and Technology, New York . My proposal was to facilitate a space for young people to show and celebrate what they are interested in watching online. Fortunately for me, the application was accepted, and the proposal became the ‘Seeders N Leechers R Us’ project between Jan-Feb 2008 . Eyebeam, as a Centre for Art and Technology, was known for having a progressive youth programme, such as the Digital Day Camp, After-School Atelier and Girl’s Eye View activities for middle and high school students. A feature of these activities, since 2000, has been the bringing together of artists, youth, and New York’s cultural dynamic forms, such as remix, fashion and hiphop. Thrown into this mix are those who are also experts in new media and technology—in particular— hacker, sustainability issues and open-source culture . It was my interest to benefit from this context to develop the ‘Clip Kino’ concept, with reference to critical US-based cultural and legal reformism, activism and education in copyright issues   . My desire was also to explore the peer-to-peer theme in collaboration with young people, using metaphors from BitTorrent  protocol. The slang terms for key roles in P2P file sharing—seeder and leecher—refer to the original uploader who provides the original file to ‘seed’, and the downloader who ‘leeches’ the content from the network. The BitTorrent protocol is also a form of encoded cooperation: When you start downloading the file you wish for, you are also, by default in the protocol, helping others, by making the file more available for them. I hoped the workshop, exploring and sharing of video-clips between us as a group, would give us the roles of being ‘seeders’ and ‘leechers’ of content—face-to-face—sharing content in presence of each other, gradually helping each other understand one another’s interests. On arrival in New York, I structured a programme of events for the teenage students-in-residence at the centre: Tahj Banks, Glen Moore, Jayquan Harris who came from Brooklyn, and Wandy Marcano from Bronx, but now Manhatten. They had all attended the previous year’s Digital Summer Camp workshops at Eyebeam, were aged between 17-19 years old, and were given a student salary for attending Eyebeam after school, 2 times per week. Hence each week, we arranged to have 2 ‘seed’ workshop sessions, and 1 ‘leech’ screening session in-between, over a period of 2 months. Sometimes other artist residents of Eyebeam presented or joined the screenings, integrating also those who were around in the Centre. The workshop sessions introduced and made space to discuss subjects such as: media awareness, local and youth representations in online video, copyright, remix, and creative commons approaches to media; as well as p2p networks and how to organise a screening event. Furthermore, we shared links to video-clip files together in physical-material space, showing to each other what we liked. Over my residency period, this process of exchange initiated from me, but increasingly shifting to them sharing with me, eventually became: from them (or us) to others in Eyebeam. The outcome of the workshop process was a Clip Kino screening event called ‘Teen Mashup’, where all content was curated and arranged by the teenagers. The audience consisted mostly of Eyebeam resident artists, staff, a parent of one of the students, and a handful of outside visitors. As the title of the event suggests, the screening consisted of video-clips chosen by the 4 teenage students’ interests, in total representing home-made music production, shock magicians on TV, hand-skills and different hiphop or gang representations of New York. The Seeders N Leechers R Us project in general extended strongly the pedagogical aspect of the Clip Karavaani manifestations, to tackle the different discussions surrounding copy-, file-sharing, and sampling cultures. One of the audience members asked a student, “Did you contact the video-clip uploaders about whether it was ok to screen their video?”. The answer (“no, we didn’t because..”) still managed to satisfy the questioner, and for me was an indicator of some online media literacy, setting a pattern for future and current pedagogical activity using the Clip Kino format . Following the lead of the Clip Karavaani project’s choice of venues, the Kirjasto 10  public library in the centre of Helsinki appealed to me as a location, and context, to continue similar, regulapublic library in the centre of Helsinki appealed to me as a location, and context, to continue similar, regular screening events. This particular library focused on music and media, had installed audio-visual presentation facilities, and promoted itself as a place “for consuming, creating and displaying culture” . I learned that Helsinki City Library was also experimenting with different event formats. Once agreed with the Library’s staff, I began a new programme of screenings developed between February- June and October-December 2008 in the Kirjasto 10 venue, under the name ‘Clip Kino Helsinki’ . There was no budget for these events, but as a library user, I was allowed to use the facilities without charge. On all occasions, except one, I invited contacts and colleagues who I knew already, who were willing to arrange 40-60 minutes long screening of video clips, selected according to a theme they wished to focus on. These ‘guest-host’ curators  arranged and presented the Clip Kino as volunteers (indeed as library users). Inbetween video-clips, the ‘guest-hosts’ were somehow expected to contextualise, or explain a bit more about their reason for selecting the clip. As a result, over the year, different themes were presented which were either socio-culturally specific (Australia-New Zealand, New York, Eastern Europe); media-specific (music representations, subtitled clips), genre-specific (youth, avant-guard art videos, animations, anarchist clips), or based on the topic of online media politics . In many cases, the theme gathered a different audience, connected as a friend to the selector, or attracted variously by the subject. When I didn’t find someone to make an event—almost noone replied to the open call for ‘guest-hosts’—I also curated several events, keeping up with the negotiated calendar of events with the library. Later, I understood that my endeavour was unusual in being selfinitiated within the Library, rather than invited by employed staff members or event producers. However, in the longer term, I had hoped that the library would continue to support this activity, and that it would be possible to invite library users who I didn’t know to be guest-host curators. I also knew that I was operating in a grey legal zone, with a little uncertainty in how to publicise these events. At the time, in early-to-mid 2008, it was not clear to me whether showing videos located on a proprietary/ privately-owned platforms, such as YouTube, in a public institution was legal. What can be shown in a Public library? The library manager advised that the events could go ahead under the pre-text that they were not in breach of copyright, and gave contact to the library’s legal advisor to inquire about the event format. For home-lending, private-use, the library pays a certain amount of money to the Finnish Copyright Association ‘Kopiosto’. In return, library borrowers are legally allowed to make a copy of the music they lend, for private use, as long as they don’t share it with others. However, in libraries, DVDs and “moving image” are considered differently. Few knew what it meant to present online media in a public library. Furthermore, issues of copyright were emerging as a serious issue for new hosts of content. At the time ‘Clip Kino’ was developing as a concept and social event platform, there were several high-profile legal cases in USA making the headlines. For example, in 2007 Viacom Inc. sued Google (YouTube’s then new owners) for hosting over 150,000 videos, quoted as a “massive intentional copyright infringement ; while in early 2008, another legal case centered upon what justified ‘pulling down’ videos containing unlicensed copyright materials . Regardless of these issues, I carried on believing that there was most likely little legal basis for the events, and that it was maybe better not to confirm this until the situation necessitated. I was aware of the ‘Pirate Cinema’ case in Helsinki , where one of the organisers was arrested by police in connection with the screening of copyrighted movies. Although I was not planning similar provocations between law and how people commonly behaved, I also felt it wasn’t necessary to overly attract the attention of “sleeping bears”  until I knew the legal context for the events myself. For this reason, the Clip Kino Helsinki events of 2008 were promoted within a trusted network of contacts via email, although the library also promoted them on their web-pages, on their electronic notice-boards, and on their info desks. Attendance was, maybe not surprisingly, small. Sometimes only 3-5 people attended, but occasionally up past 20 persons, when the event was advertised especially well. The most successful event in terms of audience numbers at the library (22 persons) happened when guest-host curator Wojtek Mejor designed a poster for his theme ‘Animation from the East’ , and placed posters at all the ‘free’ advertising locations he identified in the city . In the end, my thoughts as a facilitator-producer, at this stage of Clip Kino’s development, were centred around the two main issues. Firstly, how to attract people to attend the events, and secondly, how to encourage people to attend a library for a screening event. There were many questions one could ask: What were they coming to see? (I didn’t wish to reveal the titles via email or links that people could just look up online at home instead of attending). Who is the person curating the screening? (I hoped this person attracted some friends, peer-group). How interesting is the theme? (I hoped the theme could attract a group of people interested or curious to attend a screening about it). After facilitating 11 Clip Kino events at Kirjasto 10, despite the low attendance and publicity, I learned these were all important questions to keep in mind when organising and promoting a Clip Kino event. I have a bit of a media activist agenda. Facilitating and promoting these Clip Kino events, I aim to explore and challenge the terms and conditions of screening content in public from proprietary online platforms (such as YouTube) which emphasise private use. Considering the context of Kirjasto 10 as an event venue, video-sharing websites can be understood as a huge, parallel media archive of video-clips. Like books or music CDs, they are often found by searching with keywords, typed and entered as a prompt to the database. The search is matched with the ‘tags’ video uploaders give to the video-clips. Although these materials are within a publicly-accessible environment— the Internet—the media is stored on (mostly) privately-owned servers. In regards to physical media on their shelves, as already mentioned, most libraries contribute a levy to copyright associations to loan music CDs, and sometimes for DVDs. However online content on video-sharing websites is a still largely uncharted library territory, as the environment has developed so fast and rapidly in the last few years. Planning the Autumn period of 2008, I took a different track, inviting persons to only present activist films, and in one case, their own films, instead of general content from platforms such as YouTube. I was still uncertain of the legal basis for events as described above. Later in that year, I had to change my inaction on the matter, and confirm the legal status of Clip Kino process, what I called at the time, Clip Kino Helsinki’s ‘legal navigations’. The invite which triggered the navigations came from Finnish documentary film-makers Katja Lauttamäki and Miia Jonka, to make a Clip Kino event with teenagers as part of the ‘Suomi Post-mortem’ project , presented at the start of the documentary film festival DocPoint in Helsinki, in late January 2009. This Clip Kino event was to be also a public seminar and discussion event led by finnish youth—Sirja Eskelinen, Nelli Kampman, Rosa Kettumäki, Ina Mikkola, Karoliina Pulkkinen and Ella Soininen—who were members of the Nuorten Ääni youth journalism project at the time . The group, supported by myself and collaborator Salla Sorri, ‘channelled’ their sample selection of what they appreciated of online, including animations, new author videos, TV remixes and so on. The process developed in a similar manner to the Seeders N Leechers R Us project, leaning towards media literacy, in most part, between adults and teenagers. Moreover, the discussion this time was also highly topical, indirectly responding to negative publicity attached to youth video sharing/uploading in Finland, that followed the infamous school mass-shootings in 2008 . Working with teenagers in the Clip Kino process, within the strong moving-image copyright context of Finland, and as part of the high-profile Suomi Post-mortem project that itself was partially funded by the Finnish pro-copyright association , I decided it was time to consult the Helsinki City Library legal expert’s opinion, maybe more for my workshop participant’s benefit more than my own. The following paragraphs share a summary of what I learned from Heikki Poroila in late 2008 . In Finland, nationally-specific copyright agreements apply, which are very similar to EU and Nordic copyright agreements, but different in specific details. Unlike the United States copyright legislation - where interpretation of ‘fair use’ has assisted support for remix culture online, and also cultural or pedagogical assemblages of copyrighted material to video-sharing platforms - the ‘fair-use’ concept does not apply in Finland. According to Finnish EU copyright legislation, article 21, one may use published works in connection to “opetus” (educational use), except in the case of theatrical plays and movies, where permission is required. However, if the viewing can be considered a citation as part of a lecture (or similar format), clarifying or illustrating something you are saying by showing the clip, then this is legally accepted. Emphasis is made on the direct connection between the ‘text’ or presentation, and the video-clip. Ultimately, in Finland the copyright owner, the “Right owner”, is the only person or company who/which is entitled to allow a public showing or not. However, several aspects make the issue more complex. One is the concept of public use, and the other is the ‘browsing right’ of the Internet. If someone has posted a video-clip online—with common-sense understanding of the Internet that it is public—it is not clear if this act means that it is intended to be browsed in both private and public space. But in Finland, as in many other places, any action is ‘private’ only at home with yourself, close relatives and best friends. Even a very closed event may be ‘public’, if the persons present can be considered as ‘anybody’. An important distinction is public and private use, not public or private space. In addition, Heikki Poroila highlighted another interesting aspect with relation to the use of online video and the Internet in Finnish EU copyright law. If the public watches the movie or clip directly from the Internet, in the browser, for example via Flash-player plug-in, there may be a basis for a different interpretation. Article 11a, “Tilapäinen kappaleen valmistaminen” (Temporary copying) refers to the irrelevance of copyright, if one has to make temporary copies just to see, view, hear or read something. The video-clip viewed in the browser, is technically data stored in the computer’s temporary cache through default use. Playing from the cache memory is, arguably, not downloading and making a copy onto one’s hard-disk. Furthermore, browsing the freely-accessible contents of the internet is called the “browser’s right”. Any terms or conditions faced on the Internet are between the real user (the ‘uploader’ and in some cases the ‘user’ of the website) and the content owner. If there is a condition in which screening a video clip is outside private use, then it is a conflict between the screener and the copyright owner, but it is not necessarily a copyright infringement in Finland (as one may always refer to the “browser’s right” principle at least). These combinations of technical and general circumstances are, in hypothesis, supportive of ‘Clip Kino’ practice. I was advised these are defence arguments for Clip Kino events in Finland, but not arguments which have been tested in court. Although not necessarily ‘safe’ to do what one wants, it does give some encouragement for making public screenings containing copyrighted materials online, outside the use of academic citation. Some materials shown via the internet browser, in highly-visible public space, for free, will attract more or less attention. Note for organisers: attention should be considered to this matter and risk-assessed in advance. Between 2003-2005, I was involved in developing a pioneering online media-sharing platform called ‘Aware’ , and especially in designing and coordinating workshops encouraging people to upload images and videos to a shared database. Since, I have followed our nascent practice, and other early adopters like us, transform (with venture capital or technical prowess) into a mainstream practice, that has become an aspect and concern for millions of people’s everyday sharing, productive and consumptive media experiences online. The online environment has changed immensely since 2005 in regards to video materials. ‘Awareness’ of what is going on ‘there’ can be found in many new presentation formats. Online websites such as ‘Viral Video Chart’ , keep track of videos in countless embedded posts to blog website, giving them ranked orders, while curated video-clip features now regularly occur in specialist media magazines and newspapers, for example UK’s Guardian . In response, artists and media researchers have formed new specialist forums for engaging and researching online video. Within my own field of interest of critical media culture, the Institute of Network Cultures in Amsterdam has initiated a mailing list, and facilitated a travelling conference called ‘Video Vortex’  beginning in 2008, subtitled “artist responses to youtube”. This project among others, aims to bring together many threads and perspectives including arts, aesthetics, research, practice, reflection, exploration, collecting, experimenting, and so on. Watching video-clip materials is of course part of the process of knowing and learning what is ‘there’ online. My own contribution to this scene is the following proposal: A Clip Kino screening event can satisfy that purpose (of watching and maybe knowing) online video-clips, in the company of other persons, in the form of what I call a ‘broken screening’: there are gaps for context, introduction, comments, and opinions from both selector and/or audience. By the end of 2008, I decided to take a pause in programming and organising, and not commit to further events in Kirjasto 10, putting my focus into other projects. I did continue on the side, though, to accept invitations into other contexts to present the Clip Kino format. These gave an indication of future directions and potential for the platform to develop, and are reported below. The first invitation to present the Clip Kino project/platform outside Helsinki, came in March 2009, to make an event in the Tampere suburb of Pispala, at the autonomous cultural centre ‘Pispala Contemporary Art Centre’ . As part of their self-organised Vilkkari Off Film Festival, I presented my activity so far. It was both a reflective session discussing how Clip Kino developed, and also a selection of best video-clips I had encountered over the process, a place of communication and being together. This event produced the best selective summary so far of what type or genre of video materials passed through the Clip Kino programme in Kirjasto 10 . In addition, it indicated the value of a ‘best of’ summary event at the end of each year of activity, reflecting upon the issues of organising or presenting online video as public-use. In late May the same year, a Clip Kino event also took place within the ‘Emerging Media Practices and Environments’ symposium  at University of Art and Design Helsinki. This occasion clearly made the case for the Clip Kino format as a research tool. Sanna Marttila and Petri Kola curated a screening with the theme ‘Open Video’, as part of their doctoral research process, presenting a comprehensive interpretation of the different facets of what ‘open video’ might mean, using clips to illustrate their argument . In reflection, they emphasised the value of co-curating a screening to investigate the field of inquiry, and the dialogue involved in selecting and ordering argument or ‘research illustrations’. A third opportunity arose in Summer 2009, when I was invited to present the project within an exhibition called ‘Todellisuuden Taju’ (A Sense of Reality) at Hyvinkää Art Museum . Curated by artist Teemu Mäki, the exhibition contained many artworks both within the art museum and situated around the town centre, but also included several public performances. The curatorial theme asked philosophical and everyday political questions: How do we actually live? What really happens? How ought we live? My self-defined challenge for the invitation was to select clips for a Clip Kino event, which was itself curated into a theme. I choose a phrase from Mäki’s curatorial statement: “Hyvinkää on ‘poikkeuksellisen tavallinen’ suomalainen pikkukaupunki” (Hyvinkää is an ‘abnormally normal’ Finnish town); then went searching online video-sharing sites for examples of the locational-specific (Hyvinkää), and concepts of ‘normal’ and ‘abnormal’. At the public screening event in the art museum, with laptop, data-projector and speakers, to a small audience, I showed my selection: a mix of representations on place, but also different subcultures online which ‘spun off’ from what I found, where I searched, what I linked onto, and what I imagined before arriving to Hyvinkää for the first time . This event illustrated the potential for the Clip Kino format to augment subjects and forms, such as an exhibition, with another layer of content that exists within the broad mix and range of the online media environment. In this Hyvinkää case, art installations and performances with motor-sport clips, death metal and pop videos, documentaries of everyday life to commercial advertisements, avant-garde art videos and zombie walks. Towards the end of the year, a new regular venue for Clip Kino Helsinki was found in form of Ptarmigan Art Space, in the Vallila region of Helsinki. Ptarmigan aims to “house ideas that exist outside of the realm of the traditional and provide a space for adventurous and challenging scenarios. Whether it be performance, visual art, or interactive work, we hope for Ptarmigan to be a home for challenging, innovative projects” . The first Clip Kino event has already happened there, ‘guest-hosted’ by Jon Irigoyen in November 2009, with the theme of ‘Cyberpunk’ . The random collection of second-hand chairs in Ptarmigan, the pull-down screen, laptop and borrowed data-projector, reminded me of Jii Hutikka. His imaginary wanderings with Clip Karavaani, dreamed up by Taidekoulu MAA students two years previous, had maybe come full circle. Hopefully the exciting little venue of Ptarmigan, half public-half private will be a good place to situate Clip Clino for a while. The different venue arrangements over the years have only partly suited the format. But the mix of people who turned up to appreciate Jon’s cyberpunk selection, seemed about right: a mixture of friends, plus some ‘learned’ enthusiasts, associates of the art space, curious people, and some regular Clip Kino goers. There is another project which is similar to Clip Kino, called ‘Upload Cinema’ that offers a counter-point to the previous narratives, about how things may have developed along the way. I believe it indicates not only the popularity and potential success of online videos presented offline, but also clarifies where my project has value, despite the small scale it has maintained over the last couple of years. The social cinema platform ‘Upload Cinema’ , which began in October 2008 in Amsterdam, and now spread to Den Haag and Rotterdam, developed originally as a future scenario for the oldest film theater in The Netherlands, De Uitkijk. The project was initiated by Barbara De Wijn and Dagan Cohen, and is sponsored by the advertising agency Lowe/Draftfcb. Taking the bold steps of using a real cinema as venue, they created a members-only viewing club where the content of screenings also originates from the Internet, and it seems, YouTube in particular. Possibly the Dutch EU copyright law is either interpreted differently than in Finland, or there are less strict interpretations and applications: Their member-based club seems to be producing high-profile screening events without too much fuss. On the contrary, ‘Upload Cinema’ has been very successful, well promoted, and has been a candidate in many different web and creative industry competitions. As noted in their ‘background’ web-page for their Webby Awards entry, their case is based on the shifting media environment and regeneration the old: Small cinemas in The Netherlands have shrinking audiences, at the same time that interest in film and film-making is increasing, not only in the way it is distributed, but also in the way it is produced and consumed . Each month at Upload Cinema, there is a new theme, where “the audience can submit films; an editorial team selects the best and compiles a ninety minutes program, which is screened at movie theatres and special venues” . In this format, the organisers benefit from selections made by the extended online membership/audience. As the project name suggests, members potentially can upload their choice clip to the cinema screen (presuming it is selected by the curator). The organisers of the events use, what Jeff Howe coined as a social-media journalist in 2006, ‘crowd-sourcing’: “the act of taking a job traditionally performed by a designated agent (usually an employee) and outsourcing it to an undefined, generally large group of people in the form of an open call” . They are connecting their member’s actions—browsing and watching clips online—with visiting and copy-pasting link nominations to their own web-site. Upload Cinema is focused on remote/online curation of video clips, to fill content, although subsequently, in the last year, it has also introduced invited guest curators for particular themes. What I believe is shared in motivation within both Clip Kino and Upload Cinema, is the dragging of the normalised ‘private’ activity of viewing and sharing downloaded content on one’s own computer (at least in Western, Northern Europe and Northern America) into public space. Both turn private use of media into public use of media, and create screenings, fan appreciation, and potentially, gathered topics for debate. Within Clip Kino processes, I have consistently framed this activity pedagogical: ‘media environmentawareness’ or ‘direct action media literacy’. I continue to use this approach as a format in my own teaching, and highlight this as a link at the top of the project’s front web-page . In my opinion, face-to-face meetings of people plus screen, have been an important feature of Clip Kino events. What motivated me to keep going over the years (despite minimal funding, and low participation or attendance to events) has been the exploration into the factor of presence, in relation to online media, and the resultant encounter with another person’s choices. Like the Human Library concept, I believe that people’s choices and selections are representative, valuable, and wise on the topic of their interest. Further, in Clip Kino, presence and encounter are challenging aspects for both curator and audience, and may indeed, have inhibited participation in the Finnish context. Like the Human Library project, being present, in front of one’s own choices, in public can take some guts. The challenge of standing up for one’s choices can be as difficult, sometimes, as committing time to watch something, in this case video-clips, selected by another person one doesn’t necessarily already know. Also watching with other people, watching someone else’s choices, when the selecting person is also present, is revealing. Who finds what funny? Will anyone speak out? On the Internet, anonymous exchange and communications have pushed us in many fantastic trans-local directions, and released hyper-fast torrents of value, opinion and support through chat and discussion forums. However, sadly, it has also shared many ‘reply-comments’ of abuse. In distinction, the Clip Kino project aims towards social event platforms for sharing, in corporeal presence on-site, where and when, ideally, time is given with respect, and experiences received in return. I first met several of the people who run the SQUID project  at the beginning of 2009, and shared with them many of the stories I have written about above. It appeared rather quickly to us all that we shared some common ground, issues and ambitions in facilitating an archive of media or texts. 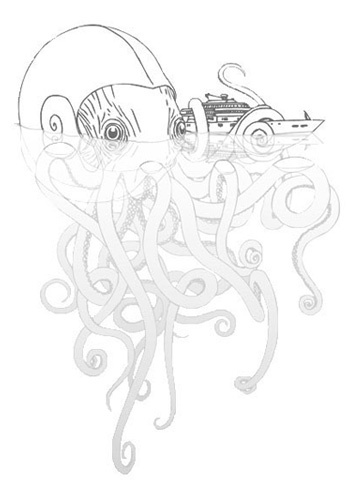 Although focused on artists or professional cultural workers, SQUID Project aims to explore, in a dialogical manner, the “complex of knowledge, interests, detours, and fascinations that amounts to it [the artist’s work]” , and create a parallel space for sharing knowledge outside the usual context. Like Clip Kino, they are committed to making public events at the site of their hosts; a “physical interface” for face-to-face presence within an online practice, which in SQUID’s case involves uploading and publishing texts online. With these similarities in the foreground, I agreed to write a text for their archive, which you are now reading. My motivation for doing so is because I previously had not created the time to fully ‘write-up’ Clip Kino and it’s example, as it is only one of several ongoing processes I have been involved in since 2007, albeit one of the most sustained ones. Simply, the SQUID invitation seemed a most appropriate occasion to do so. However, there are also similarities in the background. Like the guest-hosts whom I invited previously to organise Clip Kino events, I write as a volunteer, without mention or discussion of a fee. The time involved in writing has been intense for days, on and off for a few weeks, if not protracted in bits over a much longer time. As I can only presume also of my guest-hosts in Clip Kino, I know I get something in return: Some exposure for what interests me, and the creative act in presenting and refining that. So, I can also write about motivations in the background. I like to think that the labour of writing, as in organising, gives something new: Clarity, coherence, a narrative, something to share longer than the current publication event. Furthermore, this text, like many of the links of Clip Kino events in the endnotes, puts online into an archive my own and other people’s experience, choices, context, perspective, working issues and so on, connected and made public for retrieval, viewing or reading at some point in near or future time, or to inspire something new. I am hoping my words and thoughts can be shared, via the SQUID Project’s actions and networks, to reach the work and practice environments I am not familiar with outside my own, and likewise others enter mine in return. Up to date, I write about the current situation of Clip Kino, and it’s future. My application to the Finnish Arts Council’s multi-cultural arts fund in September 2009, to support Clip Kino Helsinki, was thankfully successful. The application proposed to re-start and support a new programme of Clip Kino events in Helsinki, 2010. Pragmatically, this will allow some small financial support remunerating my time facilitating others to organise events, importantly also, to offer a modest fee for ‘guest-host’ curators of Clip Kino events; and, finally, to have a small budget for each event to print flyers, or posters to publicise where appropriate. Within the context of the funder’s multi-cultural agenda, and my involvement in youth media pedagogy, I proposed to explore facilitating groups from different cultural and sub-cultural backgrounds. This means at the time of writing: Continue in exploring the relationship with Ptarmigan as a venue and the audience it can attract (Clip Kino is registered as one of the projects they host); the start of new connections, relations, networks, and proposals with new people and groups. I wonder how this will affect the project in terms of participant guest-hosts, audience and sustainability in the next year. I can only hope, positively, that as a project it may become wiser, better known and better supported, but, just as it began, it stays open, open for suggestions. To conclude, Clip Kino proposes a small temporary space offline for encounters around what others (you, we) watch online. Speaking for myself, the experiences of the last two years organising or facilitating Clip Kino events have kept me interested and ‘contemporary’ in online media and it’s issues, as well as allowing the pleasure of getting to know many different individuals and groups. As Lawrence Lessig says about free culture: it was/is always building upon the past. In this spirit, the organisational concept was released and presented from the very beginning with a Creative Commons license . I can argue that the project should be part of the public domain. But for now, if it inspires and pleases you: Take the Clip Kino model, adapt and re-use where you are. A Kopimi license , the opposite of copyright, specifically encouraging that the work be copied—for any purpose, commercial or noncommercial— for the activity suits even better. But if you do, please, try to share-alike. “The library of the future is all about content. The content draws on all the relevant media and media combinations. Books are, and should remain, at the very core of the library. Full use is to be made of technological innovations. The library of the future is a social hub. The collection is constantly evolving. The library is buzzing. People gather. An event marks a change. It can be a big or small occasion that generates a buzz and inspires people to visit the library. Events are an excellent opportunity for cooperation, from meet-theauthor evenings to country theme weeks, from class reunions to children’s parties” . These perspectives I can relate with, and could easily apply in the future to Clip Kino. They could easily apply also to humans who are books, and platforms that are full of text and media. This text is released under a Kopimi License. 19. Clip Kino Helsinki guest-host curators at Kirjasto/Library 10, between 02-12.2008: 02-Projekti Sosiaalikeskus (FI), Joanne Richardson (RO), Wojtek Mejor (PL/FI), 'Orgcult' Students at Stadia Polytechnic: Toni Niemisalo, Akseli Virtanen Joni Happonen, Juhana Lindström, Santeri Pakkanen and Teemu Lipasti (all FI), äpela Semion (SI/FI), Kari Yli-Annala (FI), Ann Morrison (NZ/FI), Eyebeam Students-in-Residence: Tahj Banks, Glen Moore, Wandy Marcano, and Jayquan Harris (remote, all US), Guild of Bonsai Hackers (UN/FI), Sonja Baumer (remote, US), Andrew Paterson (SCO/FI). 22. Wikipedia (2007), Lenz v. Universal Music Corporation Trial, http://en.wikipedia.org/wiki/Lenz_v._Universal_Music_Corp. 24. In Finland, the colloquialism “Let the sleeping bears lie” could apply to pro-copyright agents who I learned maintain a periodic check on potential copyright-infringing public events.